The UMW ordinarily meet on the third Thursday of the month at 1:00 p.m.in the Fellowship Hall. Occasionally, special meetings are scheduled at other times. Membership is open to any woman who expresses her desire to belong to the group, is willing to support the United Methodist Women in her own way, and is willing to participate in the global missions of the church. 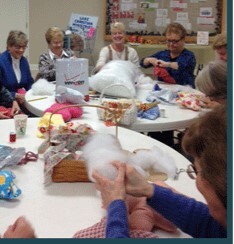 Several social events are planned during the year, in addition to major fund-raisers like the Silent Auction and Potato Bake, as well as mission projects such as Bingo at the local assisted living facility, making teddy bears for emergency department patients, filling weekend food bags for low income school children, Lake Christian Ministries events for school supplies and Christmas, and reading buddies for SML Good Neighbors to name a few.